Graciela Iturbide has found her inner theme photographing the Zapotec women of Juchitan and the Mixtec goat butchers of Oaxaca, in the company of Nobel laureates and world-renowned artists, among mourners at Mexican cemeteries and Indian death houses. Each image stands on its artistic own, but each also tells something about the fascinating artist who made it. 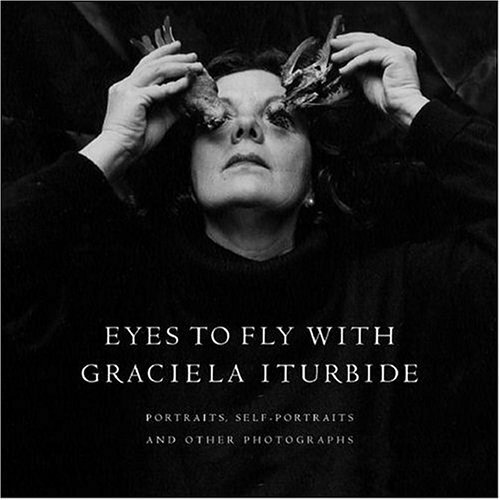 In Eyes to Fly With, which includes both iconic images and previously unpublished work, Graciela Iturbide has assembled both a retrospective of her career and an introspective self-portrait—in short, an artist's art book. In the late 1960s, the great Mexican photographer Manuel Alvarez Bravo took Iturbide as his assistant. It was a fond and fruitful apprenticeship, but Iturbide eventually sought her own career because, as she says in a conversation with the writer Fabienne Bradu, 'I had to have influences, but I also had to suppress them and achieve my own expression.' This book pulls together Iturbide's most expressive work, including select self-portraits. Bradu's interview, which appears in both English and Spanish, reveals the stories behind classic images such as 'Our Lady of the Iguanas.' (Did she pose the iguanas on that woman's head, or was it photographic serendipity?) Bradu also draws out intimate reflections on photography, Mexico, M. A. Bravo, famous friends, indigenous mythology, death, and dreams, so that turning the page to a viejo gazing at airborne gulls, it's impossible not to hear Iturbide's words, 'One day... I dreamed a sentence over and over: 'In my country I will plant birds.'' Filled with such personal images and Iturbide's own voice, Eyes to Fly With is the private tour of the artist's apartment that every admirer dreams of taking.